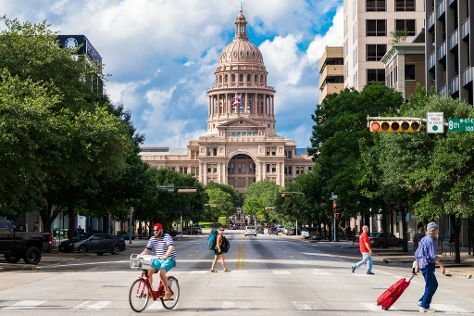 On the 1st (Sat), make a trip to South Congress Avenue and then get a sense of history and politics at Texas State Capitol. Get ready for a full day of sightseeing on the 2nd (Sun): test your problem-solving skills at The Escape Game Austin, take an in-depth tour of Bullock Texas State History Museum, then trek along Lady Bird Lake Hike-and-Bike Trail, and finally appreciate the history behind Stevie Ray Vaughan Statue. To find ratings, reviews, other places to visit, and other tourist information, read our Austin online trip maker . Atlanta to Austin is an approximately 4.5-hour flight. You can also do a combination of flight and car; or drive. You'll gain 1 hour traveling from Atlanta to Austin due to the time zone difference. In December, daytime highs in Austin are 64°F, while nighttime lows are 45°F. Finish up your sightseeing early on the 2nd (Sun) so you can go by car to Fredericksburg. Start off your visit on the 3rd (Mon): take an in-depth tour of National Museum of the Pacific War, experience rural life at Wildseed Farms, then take in the architecture and atmosphere at St. Mary's Catholic Church, and finally don't miss a visit to Main Street. For traveler tips, where to stay, and more tourist information, read Fredericksburg travel itinerary planner. You can drive from Austin to Fredericksburg in 2 hours. Alternatively, you can take a bus; or do a combination of train and bus. Traveling from Austin in December, expect a bit cooler with lows of 38°F in Fredericksburg. Wrap up your sightseeing on the 3rd (Mon) early enough to drive to San Antonio. Kick off your visit on the 4th (Tue): take in the history at Mission San Jose, then take in the architecture and atmosphere at San Fernando De Bexar Cathedral, then get a taste of the local shopping with The San Antonio River Walk, and finally browse the exhibits of The Alamo. To find reviews, maps, traveler tips, and other tourist information, go to the San Antonio day trip planning tool . Getting from Fredericksburg to San Antonio by car takes about 1.5 hours. Other options: do a combination of taxi and bus. Traveling from Fredericksburg in December, expect San Antonio to be somewhat warmer, temps between 66°F and 47°F. Wrap up your sightseeing on the 4th (Tue) early enough to travel back home.